Its that time of the year when we look back over the last year and then forward into the new one. So lets start by having a look back at my predictions for 2015 and see how I did. Kind of right in that there are more in swoops than anything else but a large proprtion of the fleet still carries older liveries. If you take the swoop and the flash schemes then they do account for morre than half the fleet now. Not quite - but not far off! 2 Darts, 2 B7RLEs, 4 Enviro 200s carry the scheme into the new year along with the last few double deckers which are in the process of being withdrawn so probably wont see much use into 2016. Only just got this right as the brand new single deckers started to arrive a few days before Christmas to enter service in 2016! More second-hand buses will join the fleet, probably quite a bit newer than the London DD fleet brought in so far. There have been rumours of ex Brighton & Hove Scanias and Go Ahead London Enviro 200s, I am happy to wait and see! Yes, I think I can claim this one. Brighton did supply DDs but in the form of Dennis Tridents which are actually pretty decent buses. there were also a few Dennis Darts from London (no Enviros) which are 05 registrations, althought these have taken quite a while to arrive and even longer to see service. Routes. I don't see much expansion beyond the City over the current network, but it wont contract either. Citybus will remain in Tavistock and Torpoint.I think I can claim this one, just, in that the spread of operations remain pretty much the same. There has been some contraction in service levels but Citybus are indeed still in Tavistock and Ivybridge but have cut back on the main routes serving these areas. Now if I just leave it there then I am doing OK.
Well First have moved into areas that were Western Greyhound strongholds but not quite in the way I expected. OK so it looks like First PLYMOUTH, but is actually operated by Stagecoach in this picture. Although I can claim a few predictions above have come to pass, there is one big elephant in the room in that First are no longer here in Plymouth - I didnt predict that! Well there were quite a few second hand buses joining before it all came to a sudden halt. The Plymouth presence will remain as it is now. 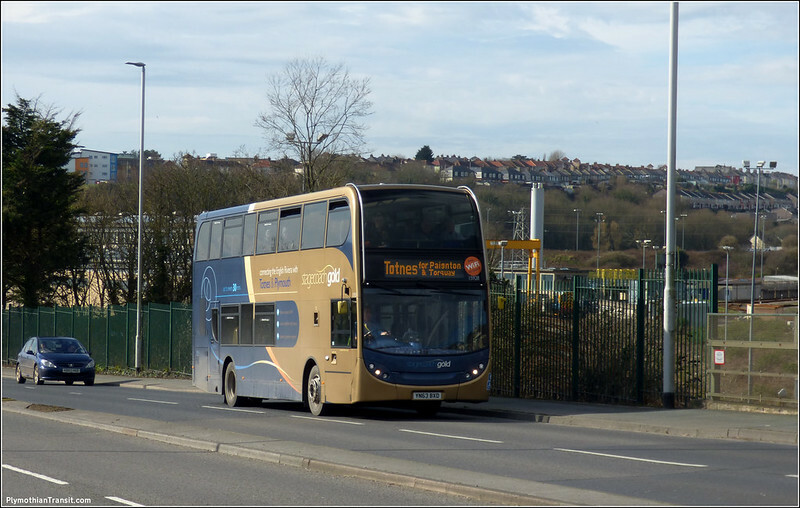 The Gold fleet will grow slightly with more routes including one or two out of Exeter.Well Gold has grown with new routes out of Exeter but you may have noticed a slight increased presence in and around Plymouth! I dont think this has hapenned, or am I missing anyone? The recent introduction of Cornwall Transit and Devon Transit has been popular and will continue. 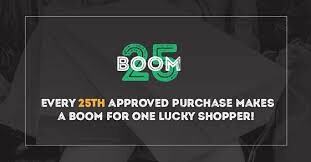 Yes - the weekly posts have continued and get good coverage with plenty of readers and comments being left with suggests its a popular move. I always say it and as usual I have failed again.No trips into Cornwall and only one trip to Kingsbridge in the whole year. Must do better! 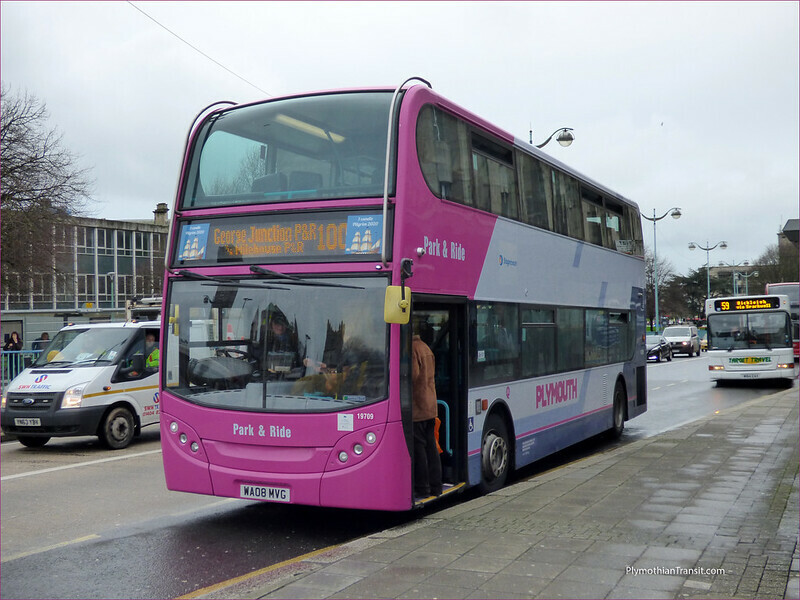 Plymothian Bus Services will continue to expand as a historical database of bus services in Devon & Cornwall.Yes. I have spent a lot of time working on this over the last year and now have much better coverage for more roiutes than ever before. I think the line “I dont see this year as having any major suprises” pretty much sums up where my predictions have failed - 2015 has seen some major changes with First selling their Devon operation to Stagecoach and Western Greyhound failing completely leaving much of Cornwall to a renewed First, who have alreasdy started to make massive improvements to their Cornish fleet. The second half of my statement though has been born out as in Plymouth there is little appetite for serious competition. Stagecoach only took on a few Plymouth routes leaving other areas to Citybus, who in return have cut back in Tavistock and Mount Batten so they can concentrate on their services elsewhere. Sometime in the next week or so I will be making my own predictions on what remains of this year… Feel free to add your own thoughts! 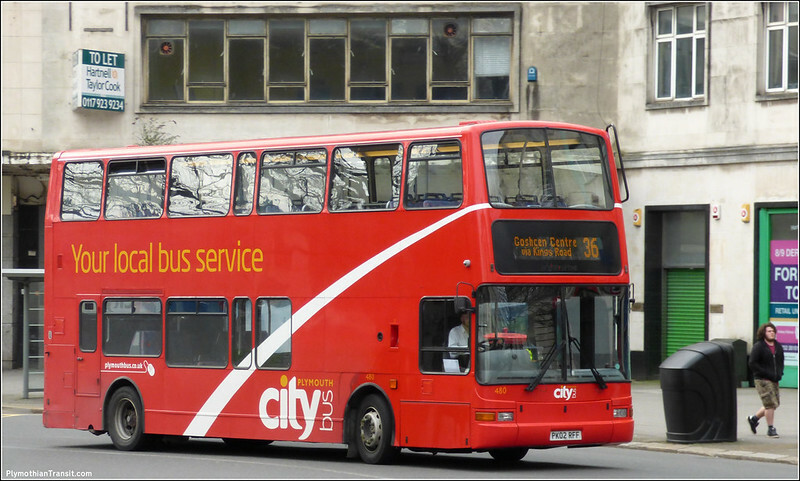 Think you got your Citybus B7RLE and E200 in old best impressions livery wrong way around ? you are right - Its been corrected. Thanks for letting me know! Didn't Beacon Bus give up early last year? I'll give you another point for that. Yes Beacon Bus did give up stage carriage work, but not as a result of DCC cuts. They pulled out back in April/May time long before any cuts were implemented. Beacon Bus ceased stage work during the year, although they still continue with schools and private hire. Did we see your predictions for this year, or have i missed them?